I may have mentioned it before, but we are huge music fans with an even bigger love of music festivals. When we heard of Nature One, a massive electronic music festival held in a former NATO missile base in the middle of nowhere, Germany, we knew we had to go. Let’s just say that two major camping festivals one week apart was less than ideal. We were exhausted and tired of camping. Also, it got so cold at night! I was dying for a warm bed. But, Nature One was unique and we were glad we experienced it. As we were setting up our tent, music was already blasting from dozens of different areas. What makes this festival extra special is that the camping area is a nonstop party in and of itself. People bring speakers, full DJ equipment, lights, fog machines, kiddie pools, scaffolding for the speakers or partiers — you name it. One campsite had a 72-hour non-stop DJ lineup posted. People go all night and all day. Yes, it’s impossible to sleep. We used our earplugs, but the bass pounding through the ground made sleeping a whole different struggle. The festival offered free shuttles to the small town of Kastellaun, which allowed us to enjoy the cheap grocery store food and also allowed for a change of scenery. Nature One has the luxury of being very popular but not mainstream, which made for a very chill vibe. Instead of a horde of bros in body paint, we found true fans welcoming everyone with songs, chants and high fives. Despite the lack of sleep, we were excited to venture through the 19 different stages of dance music. Some stages were on top of the bunkers and some were inside, others were set up inside giant tents in the back, and there were several huge open-air mainstages. We danced to trance, watched people go crazy to hardstyle, and we enjoyed some late night techno. Going into the bunkers to listen to pounding music was definitely a crazy experience. It was amazing to be able to see so many different music fans come together, enjoying one festival despite their different tastes. Overall, despite being exhausted and camped-out, we loved Nature One and would highly recommend it to true music fans. Bring your tent, a warm blanket, and the best ear plugs and dancing shoes you’ve got. What’s not to love about Amsterdam? 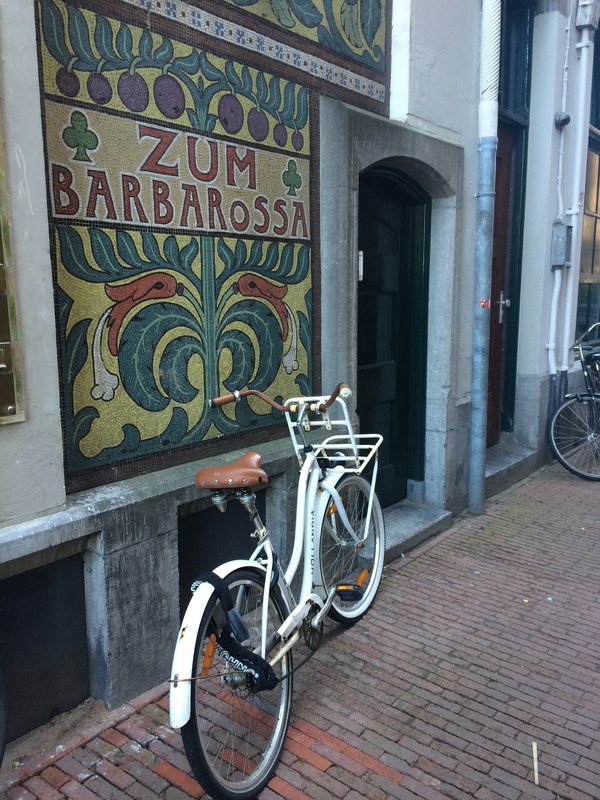 Writing about Amsterdam may be the hardest post to write. We loved it so much there, I don’t even know where to start. 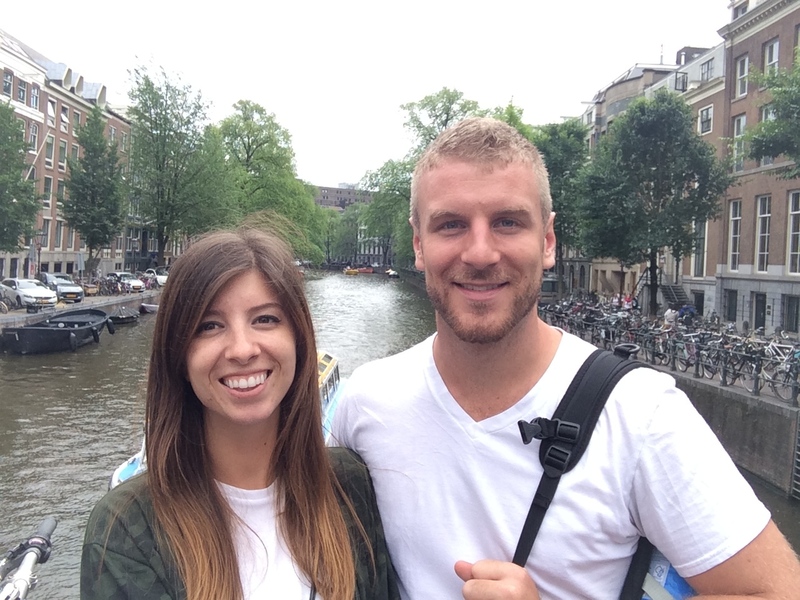 We spent a week in Amsterdam and it almost wasn’t long enough. It’s an incredibly romantic city with so much to see and do. 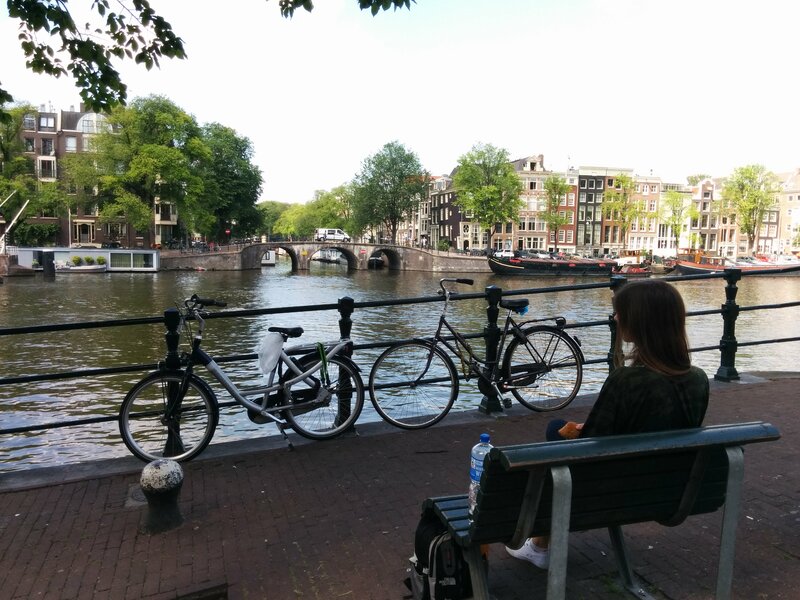 It’s so clean with parks, bikes, and walking streets – getting lost is crucial to your time in Amsterdam. Towards the end of our time there, we daydreamed about moving there. We were excited to go to Amsterdam for a number of reasons, some I won’t say here 😉 The beautiful canals, the people, the things to do, the parks, the food… it’s a little city that has it all. Walking around was easy, as everything is pretty close together, and using the transit system was even easier. We spent half of our time in a hotel and half of our time in an apartment share we found on MyTwinPlace. This is a website where you can list your place and swap with other travellers for no cost (just a small insurance fee). We were lucky to get a beautiful apartment near the canal for three nights, all to ourselves! Like Paris, we spent most of our time eating and having picnics. We loved waking up and getting breakfast at a grocery store to eat next to a canal. Eating in Europe is so cheap (and delicious) if you’re getting yogurt, fruits, and sandwich and salad stuff for small meals. This is one way we save a ton of money on our travels. On the weekend, we went to a music festival called Electronic Family. It’s an all trance music festival during the day just outside of the downtown area in a huge park. The festival was really well done and we enjoyed seeing some of our favorite DJs. It had been almost a year since we experienced anything on a large scale, so we were happy campers. We met up with my old friend Tim and his girlfriend and got to check out the Red Light district. The Red Light district is pretty cool to see, however also pretty packed with tourists. I didn’t like hearing people making fun of the working girls, so that was a downer on the experience. I’m not sure why people would go to the Red Light District just complain. We had nothing to complain about – many of the girls were bombshells and it’s cool to see the industry. All in all, Amsterdam was an absolute highlight, and such a refreshing change of culture, atmosphere and ambience. For us, it would be our favourite city in Europe. Eventually, I would even find out that Amsterdam is where Luke had my engagement ring hand-made and designed, so we can carry our time in the city with us forever. Finally, we’ve arrived in Europe! We had planned our Eurotrip for so long, it was surreal to finally touch down. We had a tight budget for Europe, since a) we wanted to come home with savings and b) we had a lot planned. So, we turned to CouchSurfing for this leg of the trip. 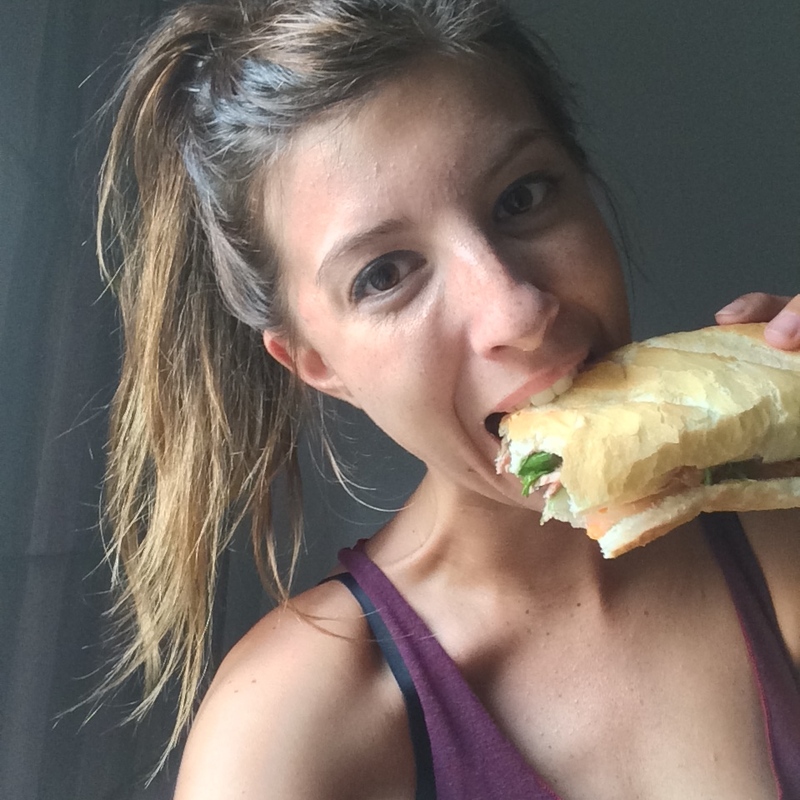 CouchSurfing is a website where people basically let you crash on their couch (or spare room) for free. It’s a great way to meet locals and see a different side to each city. Luckily, Kamil accepted our request, so we headed to his house, which was just outside of Paris. Our first order of business: meat and cheese. As we headed out on day one, we stopped by the nearest bakery for croissants, then stocked up on various meats and cheeses at the grocery store. We had missed eating these sorts of luxuries in SE Asia! We had a picnic outside of the Louvre before heading in. The Louvre was massive and definitely a bit overwhelming for us. We had no idea what we were doing as we wandered around. The Mona Lisa is a mob of people with selfie-sticks trying to catch a glimpse, which was disappointing. We walked around until our feet hurt and decided to head out for dinner. 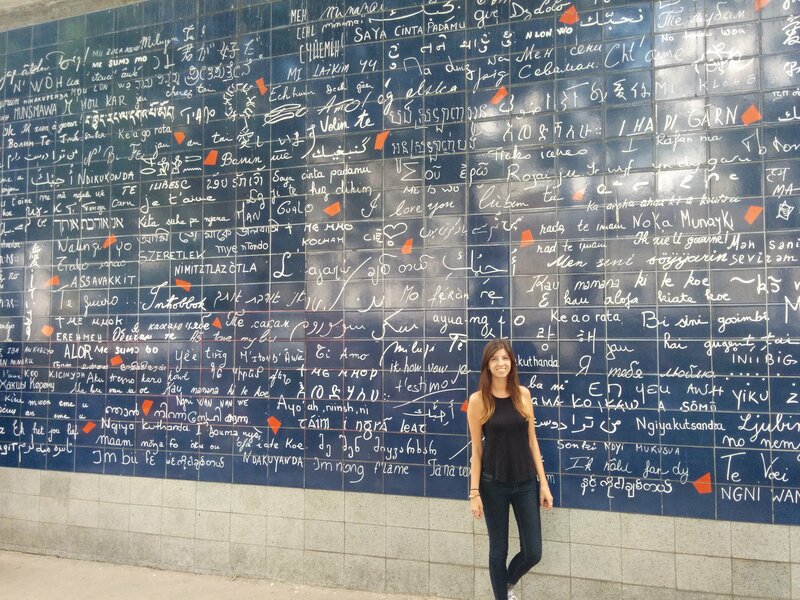 We headed towards Montmartre area for dinner and loved walking around the cobblestone streets and visiting the “Love Wall”, which has “I love you” written in every language. We enjoyed a three-course prix fix dinner (which is a must-do in Paris) and grabbed some gelato for dessert. At sunset, we headed up the Montmartre hill to see the birds-eye view and the stunning Sainte-Pierre church. There’s plenty of benches on the hill, perfect for relaxing and enjoying the sun go down. Just be careful of the scam artists trying to tie string onto your hands – they want money! And, as always, watch out for pickpockets. 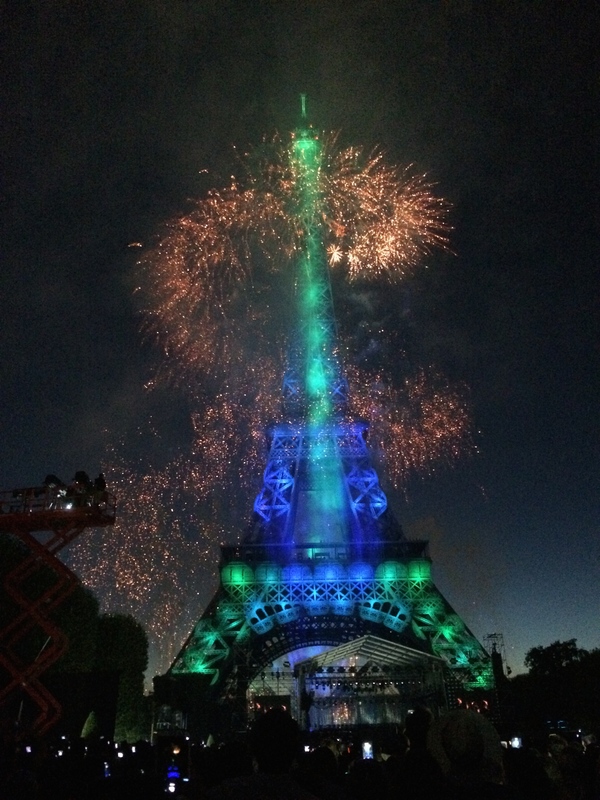 The next day was Bastille Day, French National Holiday. We got lucky, since this meant it was the day they set off the iconic fireworks on top of the Eiffel Tower. We grabbed picnic stuff, a few bottles of wine, and set out our blanket early to get a good view. A orchestra played and there were people selling anything you needed, making it perfect for laying down and relaxing. The fireworks were spectacular, which was to be expected. The orchestra played two songs synchronized to the fireworks, which was really beautiful. We’re not sure how we’ll ever be able to look at fireworks the same again. 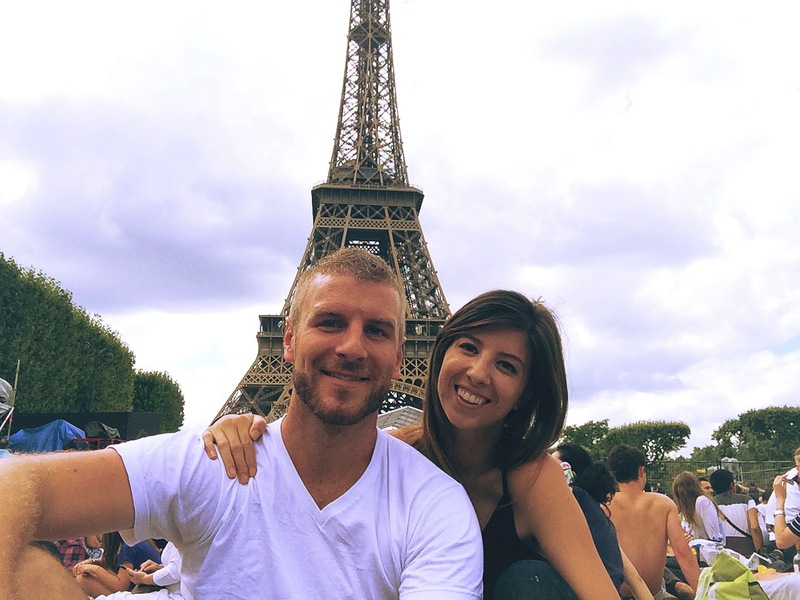 Our trip in Paris was short, but it was the perfect amount of time for us. Walking around, enjoying bread and coffee, was a great welcome to Europe and what was to come for us. Vietnam was celebrating its 40th anniversary of independence (victory over the Americans), and we both got a week vacation from our schools. 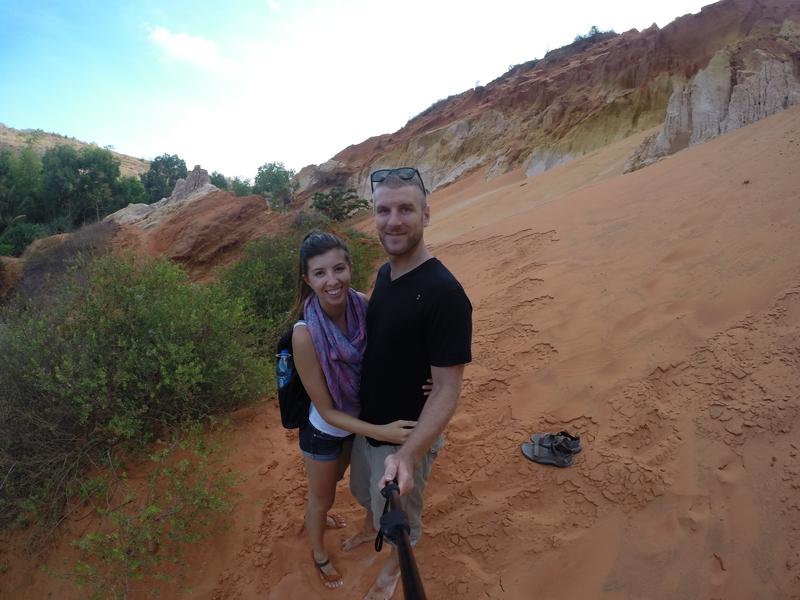 We decided to head to Mui Ne, one of the spots we had so far missed. Mui Ne is about 6 hours away via bus. You can take a bus or train from Ho Chi Minh City, but since it was a holiday, the train was all booked up for the week. We got lucky and snagged bus tickets from a couple that couldn’t go on their trip anymore, so we got a good deal. We used The Sinh Tourist bus line and we’d highly recommend it. It was a very comfortable and safe(ish) trip. 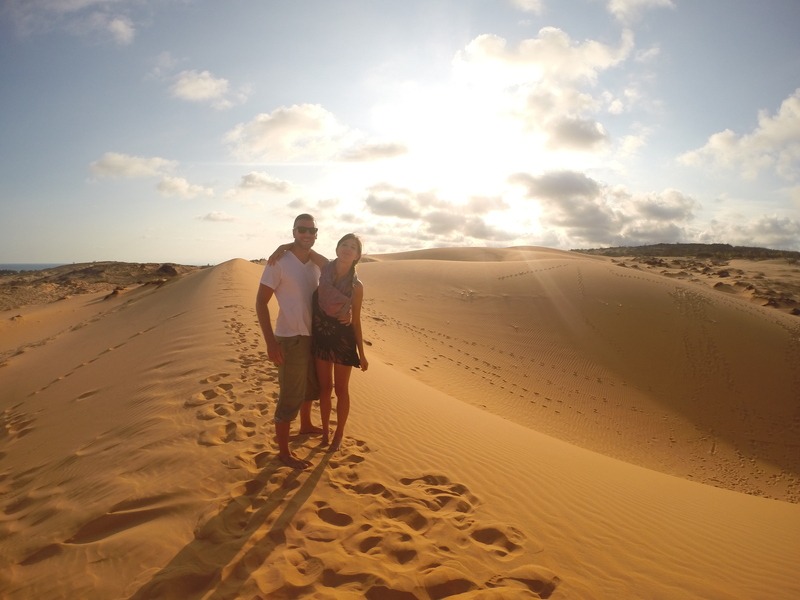 Known for its red and white sand dunes, Mui Ne is nestled in a rain shadow right beside the ocean. It has both the sea and the desert sand, making it a popular vacation spot for foreigners and locals alike. 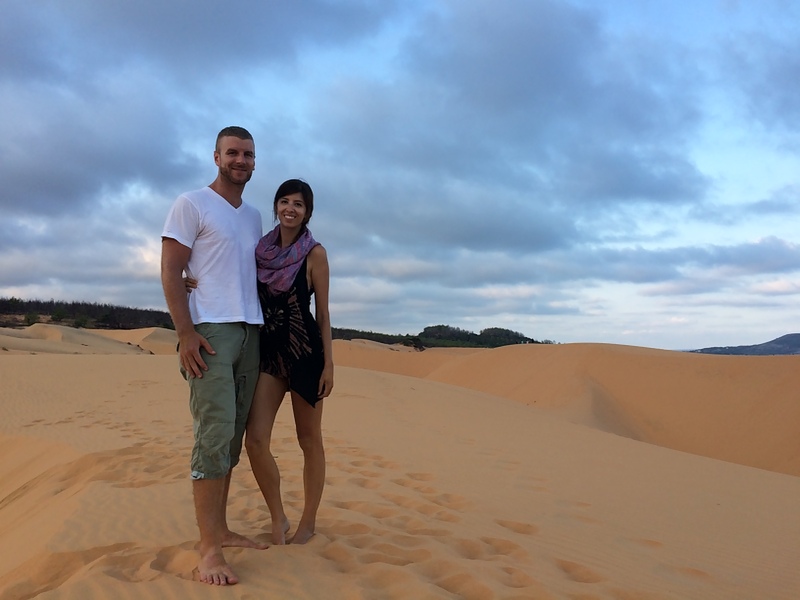 On our first day, we rented a motorbike and drove to the white sand dunes. We had lathered on sunscreen, but we burnt to a crisp anyway. They were HOT. We enjoyed seeing them, but couldn’t stay too long since it felt like we had been left to die out there in the heat. Luke gently reminded me that we were only 30 feet from the shade, but I still hold that I nearly died out there. Later, we went to the red sand dunes, which I really preferred. I think they were much more beautiful, especially if you venture away from the crowds. It’s possible that the red sand doesn’t reflect as much heat, too. At about 4pm when the sun is going down seems to be the best time. The sunset is breathtaking and the sand is cool enough to explore in bare feet. For cheap, you can rent magic carpet boards from kids to sled down the sand dunes. Note that you will get sand absolutely everywhere, so think hard before taking part. It was definitely funny to watch the Asians sliding and screaming, though. The next day, we went to the Mui Ne Harbor where you can see the blue ocean and boats that seem to go on for as far as the eye can see. It’s fun to see but really only worth a quick stop to take a photo and move on. Spring, and it wasn’t rammed with people either. We enjoyed our slow walk taking in all of the scenery. On our final day, we spent the morning at the hot spring center. For $40 total, we both got mineral mud baths, a mineral pool soak, some time in the steam room, and an hour-long massage. It included lunch as well. We lounged in the pool and enjoyed our lunch and free smoothie. 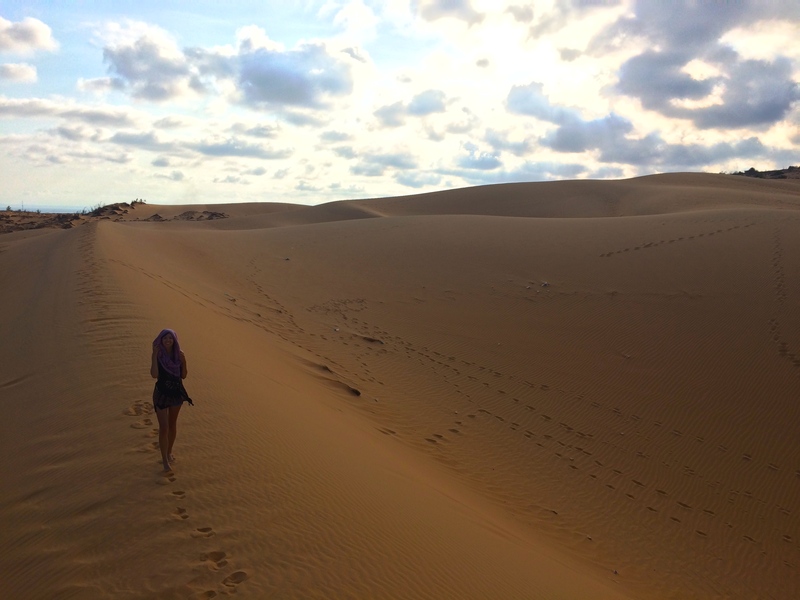 It was the perfect way to end our trip in Mui Ne. For dinner, we went to the crab markets to have dinner like the locals. We settled on a plate of shrimp, since crab was a bit pricey. It was an interesting experience, but our dinner the night before at Sinbads was the highlight of our trip. It was much more affordable, and incredibly flavourful/filling. On our way to our guesthouse, we stumbled across Pogo Beach Bar, which had beanbags and cabanas on the beach for lounging while they played some really good music. We sat on a rooftop on beanbags and took in the ocean air, saying goodbye to an absolutely perfect vacation. 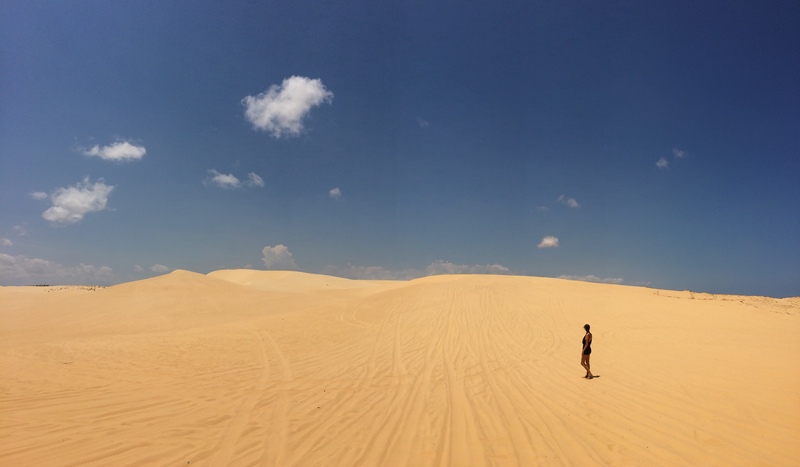 If you come to Vietnam, do not miss Mui Ne, whatever you do! And again, only pictures can really do this place justice. 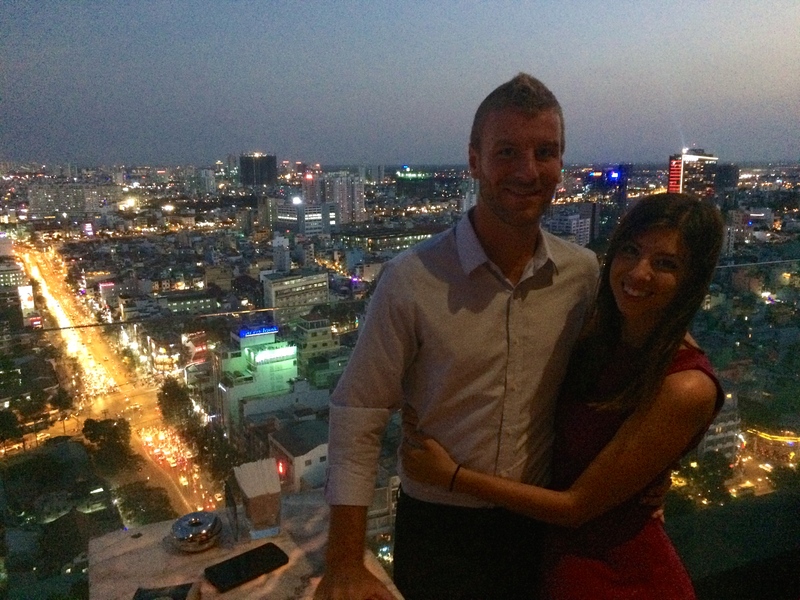 Even though we didn’t enjoy our time in Hanoi, we decided to give Vietnam one more try. We had heard that Ho Chi Minh City (Saigon, as the locals call it) was much different than the North end of the country, so we booked a ticket and tried this whole teaching English thing one more time from March until this July. As of this post, we’re just getting ready to leave again after four awesome months here. Saigon really is a lot different than Hanoi. Perhaps it’s just the fact that the South is much different than the North, but it seems that everything from the traffic, to the food, to the locals is much better. The roads are better for riding a motorbike since they’re set up with bike lanes and one ways, creating a lot less congestion than Hanoi. The roads are wider, with many of the major arteries being 3 or 4 lanes in each direction, separated by medians. In Hanoi, it was often two cramped lanes only. The craziness level is (a bit) lower and it’s way easier to get around. It took us only about two weeks before we no longer needed Google Maps. 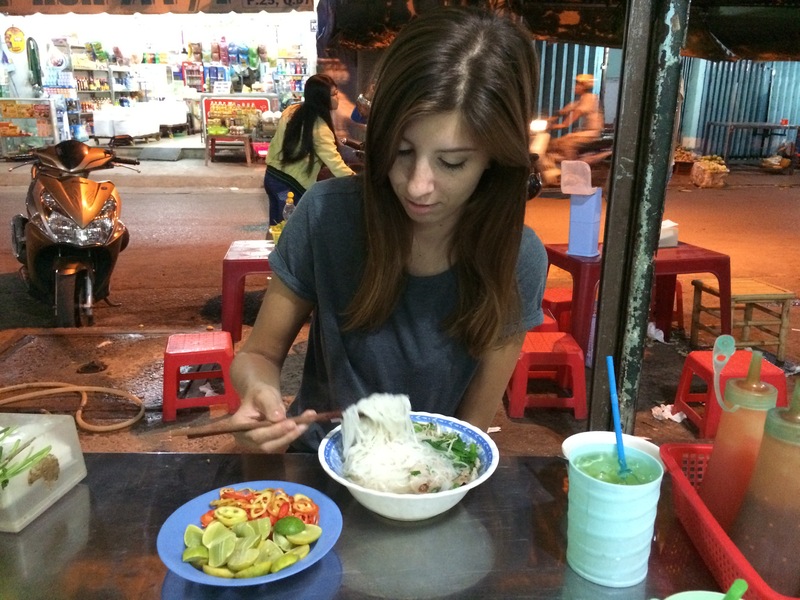 While Hanoi was amazing for traditional pho and bun cha, Saigon has so many more options, and all for incredibly cheap. We eat for about $5-7 a day, and that’s eating out for every meal. For breakfast, we grab noodles with spring rolls an d pork for 75¢. For lunch, I usually get an omlette with pork on noodles for $1 and a bubble tea (my favorite) for $1. Then for dinner, we get a buffet style chicken, pork, or beef dish with rice and veggies for $1.50. Luke often gets a large meat and rice lunch for $1-2. You can also get banh mi sandwiches at any street stall for 50¢-$1, and different kinds of soups and noodles are everywhere. I really love the ‘pho Hue’ in the alley near our house, which we get for $1.50. It’s a special pho with a red broth and rare beef. There are also juice ladies everywhere that will sell you a mango smoothie for $1, and/or a freshly juiced fruit or veggie drink. I could go on and on about the food, but that’s for another post! The locals have a much different attitude towards foreigners here, and I’m not sure why exactly that is. We are greeted with warm smiles and people who chatter away at us in Vietnamese, always excited to meet us. When we’re eating, people are so helpful and really want to make sure we enjoy their food (which we do!). Even at the gas station when my bike got blocked in, a guy jumped off his bike to back mine out for me. We have a tea lady in the front of our apartment and she’s always smiling and chatting away at us, even though we have no idea what she says. It’s nice to try charades-type conversation with her. She’s like having a watchdog grandmother always looking out for us. Another lady down our alley has the cheapest tra tac (a lemon oolong ice tea) for 25¢, and she loves asking me where Luke is when I’m alone. She makes sure to always smile and wave at us when we drive by. It’s very charming, and a refreshing change from the cold stares of the North. It’s been nice to really settle in here. We have a lady who mends our clothes for us (and gets stains out of Luke’s clothes), usually for about 50¢ or so. We have friendly ladies who run a vegetarian restaurant, where they sell buffet style imitation meat and rice at $1 a box. We have mechanics that laugh at us every time we come in but never overcharge us, and we have a smiley doorman named Lin who watches over us. We also have three friendly neighbourhood ‘So dogs’ (alley dogs) that we love to pet and feed. The locals judge Luke a little for being so hands on, but he just washes his hands immediately after. It has really begun to feel like home. 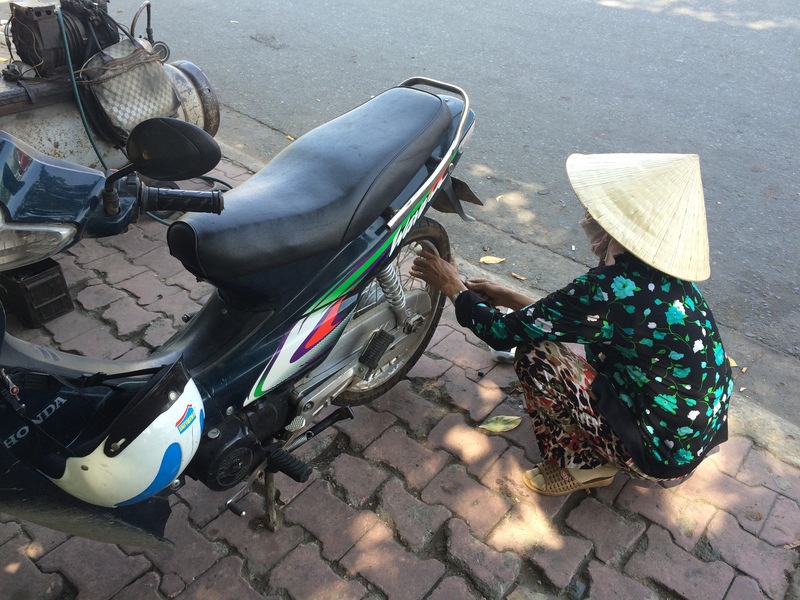 The expat community in Saigon is also much different. Here, everyone hangs out and goes to the same few places. There’s more of a nightlife and community feel here. In Hanoi, everything shut down at around 11pm, whereas here, there’s no time limit. We’ve made friends easily, enjoyed the kind of music we liked, and we get to hit up events all the time. We’ve been living in a small one-bedroom furnished apartment in Binh Thanh district, which is outside of the main District 1. We pay about $290 (not including electricity) for our place, which has washer/dryer, Internet, and cleaners who comes 3x a week (they do our sheets too!). It’s on a nice quiet alley and we have Lin, who provides 24-hour security and helps me take my motorbike out in the morning. We never have to worry about our bikes being stolen, as they’re under lock and key, and there are about three locked doors and a doorman between our apartment and the city. It’s nice to not have to worry about break-ins or theft, which is a very real reality in Asia. We bought second hand motorbikes for very cheap. My Honda Wave was $150 off some backpacker with a flight the next day, and Luke got his Yamaha Nouvo for $230. Gas is about $2.50 a week for me, and $5 a week for Luke (he pays extra for a little horsepower). It took us both about a week to find good jobs. We work down the street from one another at Korean language schools in District 7. We’ve been very happy with both places, and I have a second job at night that I love as well. All in all, I’m really happy we gave Vietnam another chance. The country is a little rough around the edges, but has such a soft side to it. We’re working a ton to save up for the next leg of our journey but for the last four months, this has been our happy home. For my birthday, we decided to spend two days in Singapore. Since it’s such an expensive city, we couldn’t quite stay as long as we wanted on our budget but getting to see Singapore at all was a treat. We took a public bus from Jahor Bahru, Malaysia for about $3. It takes you to the border, and then picks you up on the other side before dropping you off downtown. Singapore has another amazing transit system, so we bought a tourist pass ($10) and enjoyed it as much as we could. Finding affordable accommodation was a huge struggle, so we finally settled on 5footway.inn, which is a cool art hotel with a few locations. Ours was right by Chinatown and after making a note on our reservation that it was my birthday, they upgraded our room for us a surprise. It was perfect. 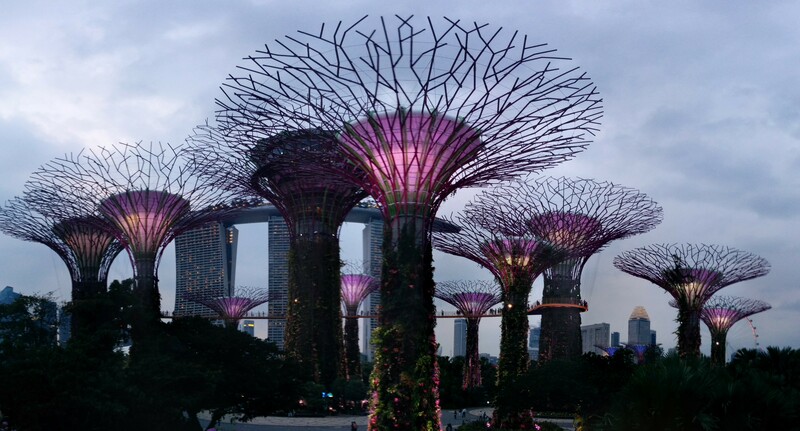 We got to Singapore in the late afternoon on our first day, so we grabbed the subway to the Gardens By The Bay. It’s a large park/artistic garden, and it’s mostly free to enjoy and explore. At dusk, they have a light show in the middle of the park. We really enjoyed hanging out under the Avatar-like trees that pulsed and glowed with lights – it honestly felt like we were on another planet. After dinner, we spent the night walking around the city and enjoying all of the architecture and art around the city. The Marina Bay Sands was all lit up and we took some selfies on the helix bridge. We also passed a hotel playing Breakfast at Tiffany’s outside, which is my favorite movie. The waiters let us sit and enjoy the movie, even though we didn’t order one of the $40 cocktails. Around midnight, we decided we wanted to celebrate my birthday in style. I checked the biggest clubs in Singapore and Zouk came up, so I went on Twitter to see who was playing. We saw that a DJ we enjoy, Mat Zo, was playing at 1am. We threw on some clothes and ran to a cab. The club was already packed and our $30 entry got us a free drink each. We cozied up to some locals who were also celebrating, and they were kind enough to share their massive bottle of vodka for the occasion. Everyone was so awesome and I even met another girl at midnight that shared the same birthday as me! Partying in Singapore was interesting and the club scene was fun to be apart of. It’s a different way of partying for sure, but the people were friendly and we had the time of our lives. We got up nice and early to enjoy breakfast on the terrace of our hotel before heading back to Marina Bay Sands. 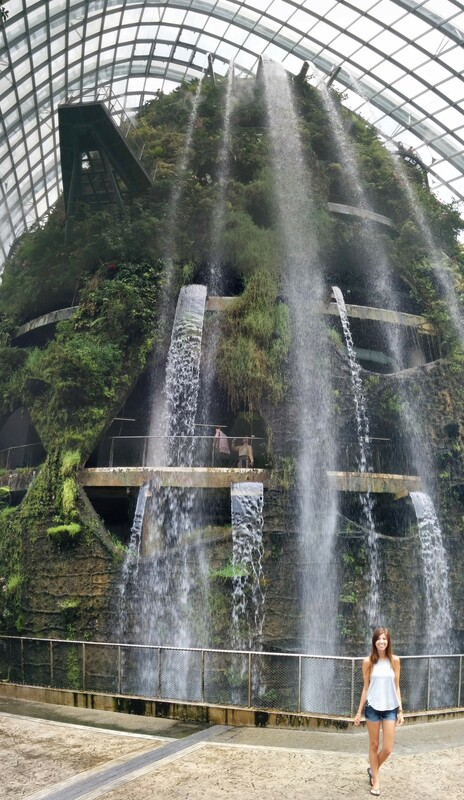 We wanted to see the Cloud Forest and the Flower Dome. Both structures are separate from and you can pay an entrance fee to do just one or both of them. We opted for both and headed into the Cloud Forest first. It was a giant glass dome with a living mountain built inside. You took an elevator to the top, then climbed walkways and bridges back down. It was really cool to see and there was a beautiful waterfall that fell from the top – it felt like you were inside a jungle rain forest. Although it was smaller than it looked outside, it was still a lot of fun to walk around and see all of the plants. The Flower Dome was a bit of a let down for us. It was another huge glass dome filled with tons of flowers and plants from all over the world. For a flower lover, I’m sure it would be pretty cool… but we zipped through it and felt pretty bored. Also, the AC was blasting in there so much that I had goosebumps the whole time. 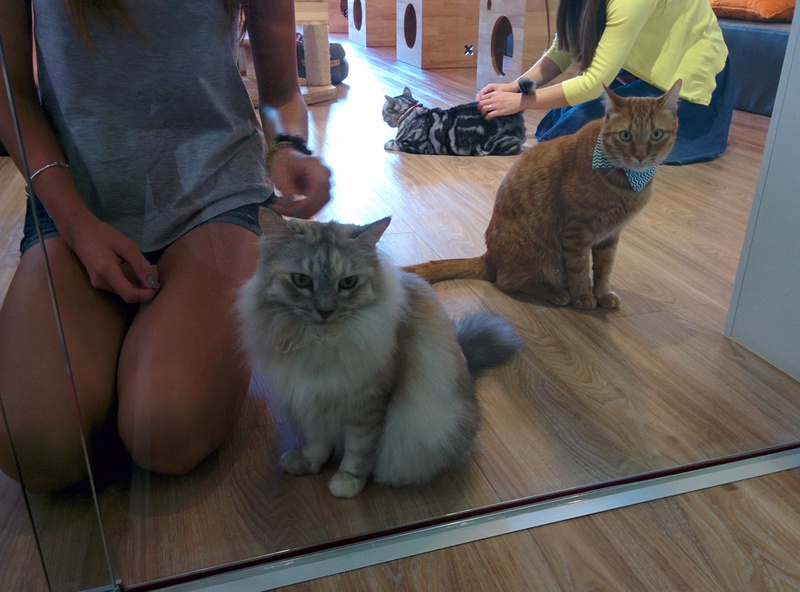 Since it was my birthday weekend, Luke decided to treat me to a cat café experience. Since he’s allergic, he hung out outside, but for an hour I was in cat heaven at Café Neko no Niwa. They have 13 cats, all of which are rescues. Some cats are deemed “lap cats” and one of the workers will go around and place them in your lap. Kai Kai, an orange tabby, decided to sleep in my lap for the full hour, which was fine by me. In Singapore, there are many hawker streets to choose from. Basically, a bunch of stalls open up and serve you any food from all over the world. Satay is Singapore’s specialty, and it’s a must try. Satay is meat seasoned and marinated on a kebab stick and done on a coal grill. It’s really delicious. We opted for some Indian food and got a whole tray of stuff we couldn’t even finish for $5 a person. Considering Singapore is far from cheap, hitting up hawker streets are one of the few ways to stay within budget. We wanted to go to the top of the Marina Bay Sands for a drink, but we got there a little too late. After 9pm, the bar charges a $30 cover charge. So instead, we just decided to take our $30 and head into the casino to try our luck. Let’s just say, our luck lasted about two rounds of roulette… oops. Singapore has so much to do and it’s such a nice, well put-together city. Most major buildings have some sort of fascinating and unique art installation, so it’s a picture taking Mecca. We absolutely loved our time there and we were both so happy we got to experience it. There’s really nothing else like it. While it’s a bit tough on the wallet, a short time is all you need to experience what Singapore has to offer. 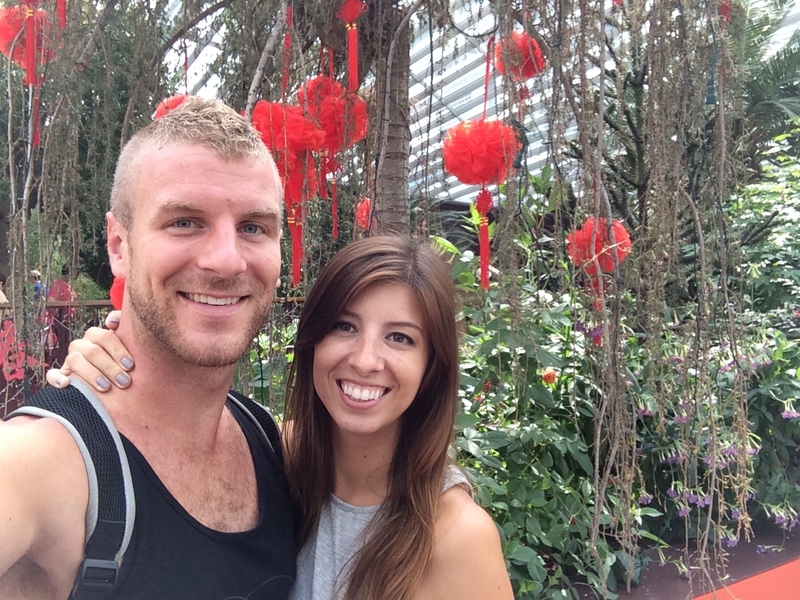 Upon arriving in Malaysia, we realized we really had no idea where to head off to next. We had arrived here on a fairly spur-of-the-moment decision, so we hadn’t planned our next stops. After browsing a few tourist agencies, we noticed several posters for Cameron Highlands, and decided to buy a $5 bus ticket. No one had warned us about the twists and turns on the last hour of the drive. We also didn’t know it would be up the side of a mountain. The massive bus was careening around corners back and forth, and both of us quickly popped a Gravol to settle our stomachs. The views were nice, but I’m surprised we made it in one piece. We had scored a quaint guesthouse for $10 a night. It was basic, but we had a private room and they served cheap (and good) food, so we were happy. Cameron Highlands is a really small town nestled in the mountains and surrounded by the biggest tea plantations in Malaysia. The plantations in this region actually produce enough tea to supply all of Malaysia, although they do export much of it. On our first day, we walked to the Cameron Valley Tea plantation. Taking about an hour, it was surreal to finally get to the top of the plantation and look down at all of the tea leaves. They explained to us that tea trees can grow endlessly, and we saw some of the massive trees that had never been pruned. The fields were filled with tea trees that were just as old, except they were constantly cut back to a size and shape that is easy to work with. We got to try some of their delicious tea and explore the plantation on our own after. On our way back, we decided to try and skip the hour-long walk (uphill this time) and stuck out our thumbs. Cameron Highlands is such a small town and the people of Malaysia are so incredibly kind, our guesthouse had actually recommended hitch hiking here. A guy and a girl our age pulled over in their work van and talked our ears off on the ride back. They were grinning ear-to-ear after having met us and we were so thankful to have a break for our feet, so the feeling was mutual. The next day, we bought a packaged tour that would drive us to the top of Gunung Brinchang Mountain, followed by the Boh Tea plantation, and finish with a tour through the Mossy Forest. It was $15 for the whole excursion and it lasted all day. The view from Gunung Brinchang was beautiful, although a bit crowded. 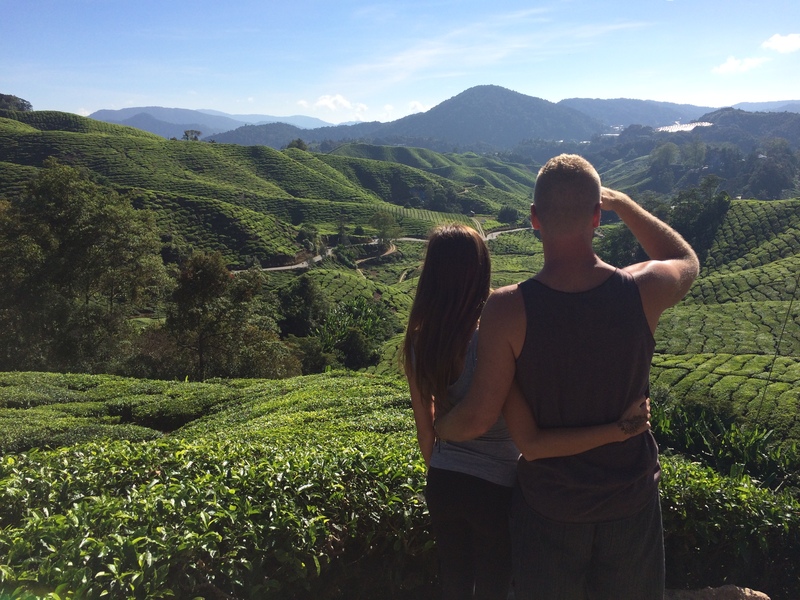 We had to battle our way up an old iron lookout post to get a picture, but it was nice to see the entire view of Cameron Highlands. After snapping a few pictures atop the mountain, we took our jeep to the Boh Tea plantation where we saw where Southeast Asia’s largest tea company. They took us on a tour of their tea fields, and we got to see them harvesting the leaves. We also went through their factory and were shown the process by which tea leaves are sorted, withered, rolled, aged and then dried. It was interesting to learn, and really made us appreciate the tea we got to try at the end! Last in the tour, we got to see the Mossy Forest, which looked like a scene from Avatar. The overgrown jungle was full covered in moss, hence the name. As this jungle was perched on the side of the mountain, the views were incredible. Our guide showed us massive pitcher plants and told us all kinds of cool facts about the forest. It was really interesting, as well as pretty. In the evenings, we spent our time relaxing. We enjoyed some incredible and authentic Indian food, met some other travellers, and went to bed early to the sounds of crickets and frogs chirping. 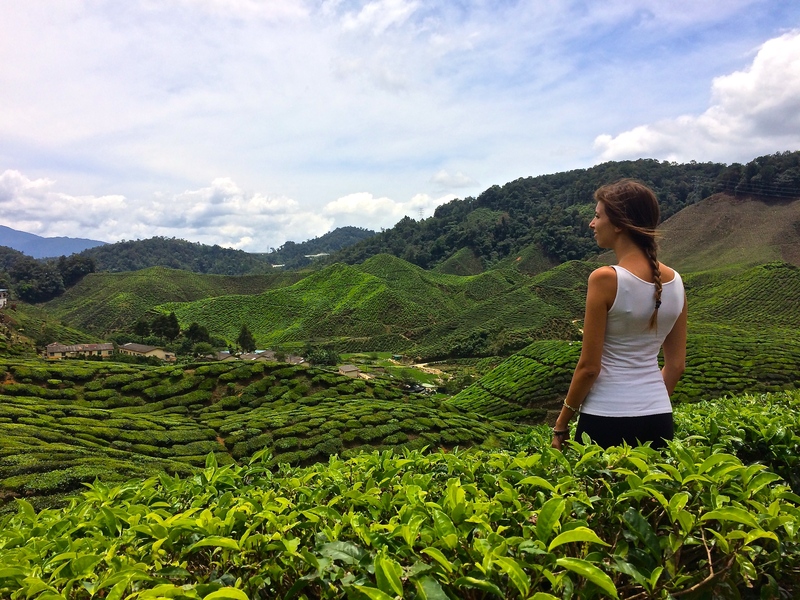 Cameron Highlands may not have a ton to do, but if you want peace, quiet, and beautiful nature then it’s not to be missed. Koh Tao is a little island off of Thailand that’s known for its scuba diving schools and picturesque snorkelling. We were very excited to meet up with our two friends from Toronto, Brad and Karalee, who were taking a week-long PADI diving course on the island. Getting to Koh Tao from Phuket was a bit of a trek. We decided to take a bus from Phuket to Surat Thani and then the night boat from Surat to Koh Tao. You can do packaged travel options but this one allowed us to enjoy the night market in Surat Thani, relax, and then save on a night of accommodation while sleeping on the boat (rather than a 12-hour day drip via bus and boat to arrive at 8pm). The night boat is about 500 baht ($15.50 USD) and left at 11pm and arrived at 6am the next morning. You sleep on these mats in rows next to strangers but there’s a bathroom and it’s all other backpackers so it was quite comfy. We arrived groggy and walked to Koh Tao Garden Resort where we’d be staying. It was 7am now and the little old couple running the place let us in, turned on the TV, and sat us down and got us juice as they cleaned our room. Luckily, someone checked out early and they let us check in right away. We highly, highly recommend this place. We got our own bungalow for about $15 a night and it was just like a cottage. It was perfect. Luke surrounded by his new friends. 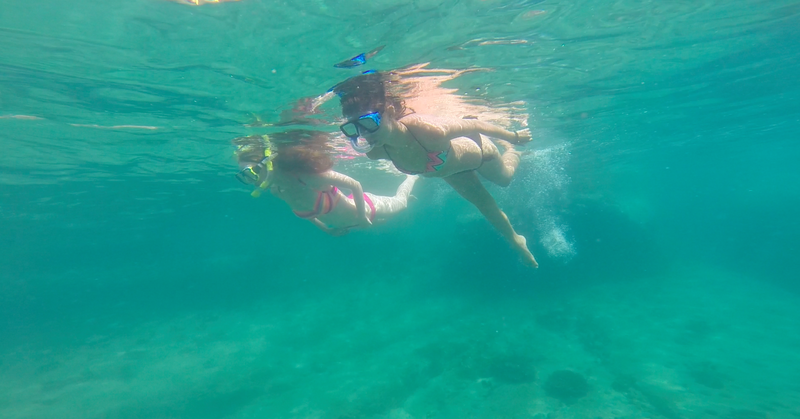 Since Koh Tao is known for snorkelling and scuba diving, we opted for getting ourselves our very own snorkelling sets, renting a bike, and checking out all the recommended snorkelling points. The snorkelling on Koh Tao is incredible. There are many spots where you can snorkel within ten or fifteen feet of the shore and already see hundreds of brightly coloured fish, sea urchins, and coral. At the northern tip of Koh Tao is the Sunset View Restaurant, with public access to an excellent dive site. As there is food from the restaurant hitting the water, there are schools of fish waiting in the shallow water where you jump in. It doesn’t get any easier to snorkel! This was also the site where Luke managed to spot a large blue triggerfish. For those considering snorkelling, I think it’s well worth it to beach hop and see what each location has to offer. Some spots we visited were relatively empty one day, only to be filled with fish the next. All in all, it was great swimming and snorkelling pretty much wherever we went. We also spent some time with Karalee on a secluded little beach called Freedom beach. A cute little beach that’s a bit off the beaten trail, it’s a perfect haven for getting in some snorkelling or taking a nap. Seashells hang in the streets and there’s an awesome lookout on the way there. Overall, Koh Tao is a perfect getaway from the hustle and bustle of the other islands and it still has everything you need: beautiful beaches, nightlife, and just enough charm. Luke and I watched The Beach before embarking on our trip to South East Asia, so getting to see Koh Phi Phi and Maya Bay was on the top of my list while we were island hopping through the south of Thailand. We kept our stay on Koh Phi Phi short because finding affordable accommodation proved to be a bit difficult. Originally, our budget only permitted a one-night stay at $25/night; after falling in love with the island however, we decided to stay an extra night. Koh Phi Phi is absolutely stunning. It’s hands down one of my favorite islands. It’s nice and small, but big enough to do some exploring. There’s tons to do there and you can enjoy the bar life, shop, hike to the viewpoints, go snorkelling, or take a day trip to the many little islands and beaches nearby. We loved the catching the sunset. On day one, we got in and grabbed some food before heading to the viewpoint. It was incredibly hot and steep, but it was well worth it. We got to watch the sunset dip into the ocean while we were overlooking the entire island. The view is priceless up there. Later that evening we explored the nightlife. There are tons of backpackers and all sorts of crazy bars offering everything from beer pong to Muay Thai. The latter bar will give you a free drink if you fight in the ring with another traveler. We happened to drop in just in time to see a couple of guys all suited up in Muay Thai gear fighting it out for their alcoholic prize. It was pretty funny to see. The next day, we were up early for our Maya Bay tour. There are tons of tour companies offering basic tours of the surrounding islands, including Maya Bay. We grabbed one for $12 USD that included Monkey Island (a little beach with monkeys crawling all over it), the Viking Cave (just a drive by – it’s a large but unimpressive hole in the side of a rock wall), swimming in Phi Leh Bay, and finally some snorkelling and lounging at Maya Bay for an hour. Most of these cheaper tours are pretty basic, and the “tour guides” are just locals with long tail boats. It’s hit or miss if you’ll get a good guide, but on the plus side you get some rice and fruit on the boat. Our guide was pretty cranky but luckily the view on the trip was worth it. We managed to snag one picture away from the crowds! Getting to Maya Bay (aka The Beach) was a bit disappointing but we were still happy to be there. The beach is RAMMED with tourists. The bay is filled with boats, including long tail and huge cruise ships. There are people crawling everywhere. It’s hard to take a picture or relax. It’s a shame, since that’s what the entire movie was about – how tourists spoil the natural beauty of places. It seems like the fame from the movie has done just that to this beautiful bay. deep and bathtub warm. I loved floating in it – it was warm, crystal clear, and the sand was that dreamy soft white. We spent a lot of our time just swimming and enjoying the view of the bay. On night two we caught an epic two-hour fire show before heading down to the beach where they had a bunch of bars playing music. Of course, we found one playing our type of chill music and we relaxed while meeting some other travellers (and even a made a dog friend). We’re so happy we opted to visit Koh Phi Phi. It’s something not to be missed. Here are some pictures from our stay!